Gun holsters: What is the best? Many new shooters ask this question, but there is no objective answer because it’s a personal choice for each shooter. PDN Contributor Deryck Poole has some guidelines and several gun holsters to examine. 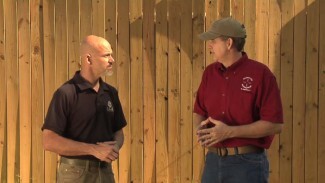 There are four criteria for selecting a defensive handgun holster. First, select a holster that completely covers the trigger of the firearm. You don’t want anything to get into the trigger guard area and accidentally discharge the firearm while it’s holstered. Second, the holster should be designed for the firearm you’re carrying. When you insert the gun into the holster, you should get a good positive retention. The holster should be made to fit your make and model of handgun and allow you to get a full firing grip while the gun is still fully in the holster. Third, select a holster that securely holds the firearm. You don’t want the firearm to move around or potentially come out of the holster unless you’re drawing it. Lastly, the holster should retain its position on your body. The holster should stay in place — you should not have to adjust it because it’s moved as a result of your regular daily activities. This is especially important for concealed carry holders. Keeping these four criteria in mind, Deryck looks at some specific gun holsters. If you’re looking at all-leather gun holsters, choose one that is designed for your specific handgun. 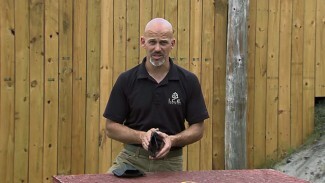 Deryck shows an all-leather pocket holster that meets all four criteria. 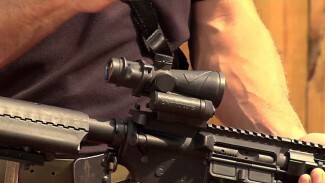 All-kydex gun holsters are popular. Kydex is a man-made material. When you hear a solid “click” sound when inserting the gun into the holster, you know the holster is doing its job of retaining the firearm. Gun holsters with a leather backing and kydex front are very popular too. Many IWB carriers like the feel of leather against their body as opposed to plastic, especially in the heat of the summer. Deryck also demonstrates the different types of clips that come on gun holsters to lock them into place on the body, and much more. I am a sports medicine chiropractor. I work in dress slack and tucked in Polos. I am having a hard time finding an inside the belt holster that doesn’t print. Any recommendations? Hi Gary. Printing is a combination a few different factors so it’s going to be hard to say “Holster X” is perfect for you. Based on your described work attire, you need a holster that allows you to tuck in a shirt. Crossbreed makes a great holster that allows you to tuck in the shirt. If you need extra deep concealment a good option is matching their holster with a Ulticlip 3 which allows you to clip the holster to your pants and put your belt over it. Their other offering which is popular is the belly band with holster. If you are looking for a kydex solution there are many but we recently had a review of Wingman holsters and their use of the “Fabriclip”. That combined with a “wing” will go a long way in helping to conceal the handgun. The links to all the companies mentioned above will be included below but one last thing that might help. Since the part of the gun that really needs to be concealed is the grip of the gun so choosing a single stacked gun will help as well as using a slight cant of the holster so the grip isn’t parallel to the ground.